Even though I still read them once in a while, I am generally skeptical of self-help books. They are always incomplete, in my opinion, because they have to boil down scientific research (if they are even based on science) into easy-to-sell concepts and action steps. Getting Things Done is a good example. A recent classic in the “productivity” branch of self-help literature, GTD’s entire system is based on a ridiculous notion: to truly feel relaxed in the world, one must have all of one’s actionable ideas “captured” into sorted lists. Can you really enjoy a casual walk with a friend, the argument goes, while not having a written account of all of your preferences and next-actions for all of your projects close at hand? The answer is yes, in my opinion, yes you can enjoy your life without planning it every step of the way. The assumption the book makes becomes a personal-productivity tyrant: one can scarcely have an idea pass through one’s head without feeling an obsessive urge to write it down in one list or another. Of course by “one”, I am referring to myself. That is not to say that I will credit the plethora of useful lists I keep for work-related tasks and the tickler file I employ in my office to none other than David Allen, the writer of Getting Things Done. I just realize that any self-help book is going to offer partial solutions to any problem, and one must have a healthy capacity for what Aristotle called “practical wisdom”, phronesis, to pick and choose what’s useful for one’s life. So when I perused the Chicago Tribune’s weekly literary section – Printers Row – one day in early January, I read the article titled “Seven books to aid in your new year’s resolutions” with a large grain of salt. But one book did catch my eye, and with the glad-handed aid of Amazon’s cursed 1-click purchasing system, I ordered and downloaded Switch: How to Change Things When Change is Hard onto my e-reader device. 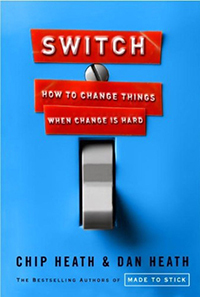 I’m two-thirds of the way into Switch, and I really like this latest offering to the self-help community written by two brothers, Chip and Dan Heath. One of the things I look for when reading a new self-help book is the type of gimmick the author(s) chooses to lay out the core argument. Sometimes there is an arch-metaphor that sums it all up in a nice, neat, and consistent image. Sometimes there is no grand metaphor, and a series of catchy-sounding concepts (like GTD’s “Five Stages of Mastering Workflow” or “The Collection Habit”) are patched together in a quasi-logical compendium. The bread-and-butter basics of self-help book organization schemes is the acronym, as in the Heath brothers’ earlier work, Made to Stick: Why Some Ideas Survive and Others Die, where the chapters titles are laid out to spell SUCCESS (Simplicity, Unexpectedness, Concreteness, Credibility, Emotions, Stories). Thankfully, in Switch, the Heath brothers decide to go the more original route and bench the star quarterback – the acronym – in favor of the the arch-metaphor. The recurrent image the authors choose to tie the concepts of the book together is borrowed, they admit, from Plato’s allegory of the soul (and you thought I wouldn’t find a way to bring Plato into this post as well). The allegory in Plato’s dialogue, Phaedrus, is that the soul can be thought of as a chariot with two horses. One horse is noble, which is our spirited and emotional part that is urged forward to do good deeds. The other horse is the irrational, passionate, chaotic part of our natures. The charioteer represents our reason and rational mind, the part of us that should guide the entire chariot system. This basic framework has been “redrawn” in various forms by other mythologically-minded philosophers who followed Plato, including Freud with his iceberg model of the psyche. The Heath brothers take up the call and tweak the chariot metaphor to their purpose. The two horses get merged into one elephant (our emotional part, good or bad) and the charioteer, who seems to have lost his traditional Greek mode of transport, now becomes just a “rider”. To the Rider and the Elephant gets added the Path as an arch-metaphor component, which represents where we want our (now suddenly more Carthaginian than Greek) soul to travel. The first surprise about change is that the problem usually isn’t people, it’s the situation. The lack of initiative for change often isn’t laziness, it’s exhaustion from butting your head against the wall too many times. Resistance to change is often lack of clarity – we often don’t know specifically what we need to alter in our lives. I should talk about these some more, but my obsessive urge to finish this post before midnight for it to qualify in my self-imposed rules for the Post a Week Challenge means I’m going to move right along onto the next topic (hey, my blog posts are too lengthy anyway). So my original intent in reading this book was to increase the probability of fulfilling my new year’s resolutions for 2011. Switch made me realize two things besides the points mentioned above (in the way that self-help books make you realize anything, by drawing attention to something banal that is readily observable in everyday life but that we have ceased to notice because of habit). First, people frequently base their decisions not on rational arguments but on identity. “I’m the type of guy that will do X”. “Because I am Russian, I like Y”. For me, a barrier to going to the gym more often is that “I’m not the type of guy that obsesses over my physical image”. But I’m also the type of guy that likes to be healthy. I’m the type of guy that doesn’t like to be confused, so I’ll just chuck this dilemma altogether and not go to the gym. This was 2010. This is also what I think is termed an “identity crisis”. But I’m not the type of guy that has those. The second thing I picked up after reading this book is that your Rider can trick the Elephant (still following the metaphor?) into acting more smartly. My new years resolution this year is not to work out three times a week. Instead, one of my resolutions is to literally drive my car, gym bag packed, into the parking lot of the fitness center every Tuesday and Thursday after work and on Saturday morning. And nothing more. From that point on, I can do anything I want. I can go home, go to a cafe, go to a friend’s house, and, of course, I can always work out. The important part is that I eliminate the first few steps of the process, which are usually accompanied by self-defeating psychological triggers. Needless to say, I have done my fair share of driving in and right out of the parking lot of the fitness center this month. But I have also worked out some. 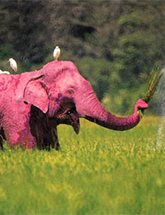 One hopes the Elephant will be tricked into doing some things better this year. You had me at allegory of the soul/chariot allegory tags. Now to scroll back up and read. Onward, passions! Onward, Reason! Thanks for the post. I think that any self-help book will be messy in “real life.” I’m reading “A Hidden Wholeness” by Parker Palmer. Some great advice, but when I try to do it, I get depressed. A friend of mine said today that it sounds like I’ve been getting something out of the book, but I shouldn’t be a perfectionist. I’m thankful for his words, because its perfectionism in implementing self-help rather than lack of help that weighs me down. So far so good on the post-a-week! Christopher, my post tags always promise more than the post delivers – it’s how I bait any unsuspecting internet surfers. Rich, you have no idea how long it took me to finally allow center- and right-tabbed manila folders into my GTD file cabinet; the regimented default was left-tabbed only. But all of the labels still need to be printed and not hand-written, definitely need to be printed. Nice post! I especially enjoyed the 3 Surprises about Change. As someone who is into OB stuff and seeing a lot of these types of changes in work life, this is quite refreshing as companies keep changing people and deriving at the same or worst-off results. I think the lack of clarity in most cases are #1. I also enjoy the Pluto mention and how you trick yourself into going to the gym. I need to do that, too. Except I need to trick my self to walk there. Lol.